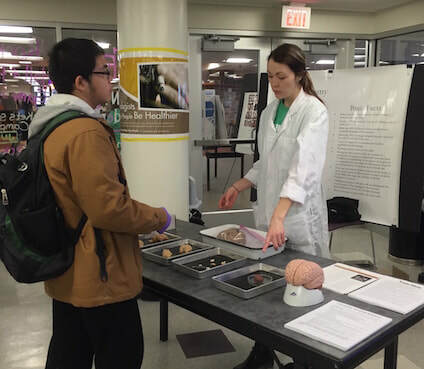 The annual Psychology Fair gives high school students the opportunity to learn more about the many aspects of psychological science. 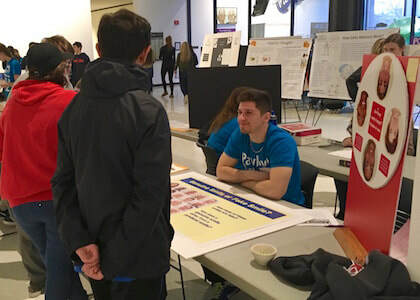 Hosted by NU psychology students and faculty, the fair is free and features a variety of interactive exhibits and demonstrations that provide a sampling of the kinds of problems that psychologists study and the methods they employ as they try to answer questions about the mind and behavior. 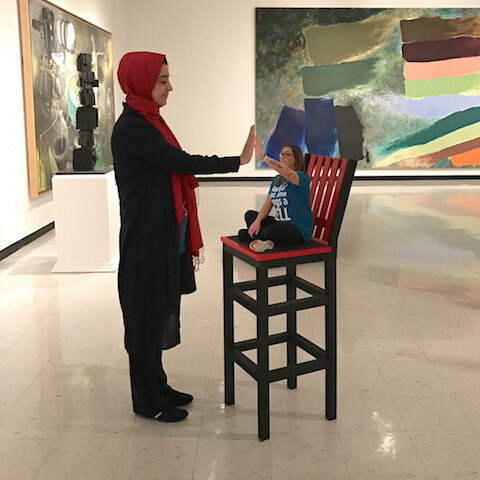 The exhibits and demonstrations cover a wide range of topics, including: neuroscience, memory, perception, social psychology, clinical psychology, problem solving, abnormal psychology, decision making, psychology of aging, and child development. Here are some photos from the 2019 fair, which was attended by nearly 300 students. The 2019 fair was on March 22nd. If you are a high school psychology instructor, please contact Burt Thompson for information about bringing your students in 2020. Cindy Stappenbeck, NU alum and Assistant Professor at the University of Washington, gave a presentation describing her research on alcohol and dating violence. Kathy Sdao, NU alum and Certified Applied Animal Behaviorist, discussed her experiences training a variety of animals, including dogs, dolphins, and E. T. the walrus. Jennifer Mills, Professor of Psychology at York University, discussed her research on dieting and eating disorders. David Smith, Professor of Psychology at the University of Buffalo, described his studies on animal metacognition. Bennett G. Galef, Professor Emeritus at McMaster University, discussed his research on mate selection. Karen Adolph, Professor of Psychology and Neural Science at New York University, gave a presentation of her research titled “Behavioral Flexibility: Infants to Elders."